What lies outside of your perfume comfort zone? Which fragrances are still challenging for you? The other day I voluntarily donned a perfume called I’m Rock and immediately regretted my choice. I decided to test my boundaries wearing a sweet gourmand fragrance, but when I’m Rock turned into a candy factory on fire, I cut the experiment short. I don’t have a strong sweet tooth when it comes to fragrances, and I’m Rock wasn’t the best choice. Another group of scents that I don’t enjoy are the watery, aquatic perfumes, even if they are well-made like Issey Miyake. An accent of watery notes can give a gauzy, weightless effect to rich florals like Marc Jacobs for Her, but a generous dose smells sharp and cold to me. I still keep on trying scents, even if I suspect that they may not fit the bill for me. Hope springs eternal that I may nevertheless find a hidden gem. At worst, if a perfume turns out to be a scrubber, some makeup remover (the kind designed for waterproof cosmetics works best) is all it takes to remove the offending scent. The thrill of discovery is worth a few duds. 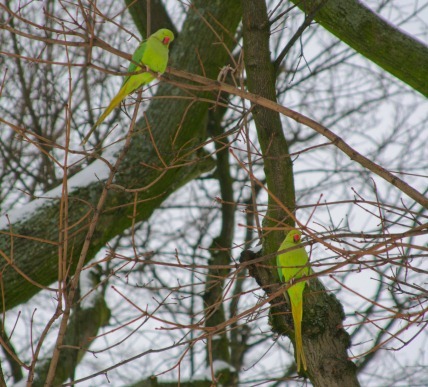 Photography by Bois de Jasmin, parrots testing the Belgian winter. susan: The original Diorissimo was so exquisite. It was one of my first perfumes, introduced to me by a favourite aunt, a lady of great elegance. Unfortunately, the new formulation makes me sneeze. The delicacy is missing. george: There are lots of fragrances that have an element I don’t like- the dirty bath mat aspect of Kouros, and the dirty aspect of Rose 31, which smells of something so disgusting that I wouldn’t even write what it is. But at the same time, I love other fragrances with a good dose of wrongness. I kind of think that it more often more a case of lack of balance, or when a perfume obviously smells like X, or a note is so prominent- whether it be candy, a flower or something dirty that I either can’t be bothered with it, or I just feel that I’m making a strongly reductive statement about myself by wearing it. And that’s how I would feel about a really, solely sweet fragrance like I’m Rock, that I would be making a statement about myself as being a really sweet person, which, if I’m being truthful, I’m not. Zazie: I don’t know if it answers your question, but many scents I love have a “nasty” facet to them: the opening of Shalimar, the aldehydes of Chanel 5 and bois des iles, the rubber in tuberose criminelle, the watery greenness in Carnal flower, the sugar candy disguised in fracas… the list is very long! behemot: Tuberose Criminelle… believe me or not, this is the only white floral perfume I really love. Tuberose is still a challenge to me, I am trying to love Carnal Flower.. Most white florals give me giant headaches. Ilia: I felt that way about LesNez Manoumalia. To me it smells of rotten apples in the bushes on a hot summer’s day. But it’s also addictively moreish because I catch gardenia there every now and then. Zazie: I try to avoid watery and sugary scents – sometimes I venture trying perfumes outside my comfort zone, but the results aren’t very encouraging. It’s what makes me very shy in testing new perfumes on skin. Zazie: Oh, another difficult “family” I try to tame: the “rose centric”. Juliette has a gun citizen queen. all Bond n°9 fragrances I’ve tried. Chanel la pausa has it HUGE. Hermes gentiane blanche and un jour, if I recall correctly. I cannot in any way smell the horrible monster during the first development of the fragrance. But when it pops up, during mid-development, it just keeps on growing (must be a looooong molecule), and will stay for many, many hours getting stronger by the minute. Patt: Immortelle is a deal-breaker for me (dislike Sables, Tilda Swinton Like This, The Afternoon of a Faun, and Interlude Woman). allgirlmafia: I read interesting reviews of Sarah Jessica Parkers ‘Covet’. It sounded envelop-pushy so I decided to purchase the full bottle I found for a bargin on ebay. Though I could understand and appreciate the things that made it unique to me the fragrance smelled more ‘vintage’ than my actual vintage bottles of Aromatics Elixir and Climat. ‘Vintage’ and mildew. Thats what it smelled like on me. I still pull it out from time to time, but no. Liz K: I suffer from migraines so really have to be careful even when wearing favorites but anything smoky is completely out for me (Lonestar Memories, I’m looking at you) as that liquid smoke stays with me for days bringing waves of nausea. I also find most musks smell very sweet to me so while everyone else thinks I smell like armpit, I smell nothing but sweet warmth and get a bit paranoid about it. Some of the stronger orientals get me too. I actually do like melon and aquatic scents but only for a brief period. There has to be something worthwhile underneath. Cumin always smells good and warm to me, rarely sweaty- but I grew up eating comino seasoned meals almost every night so it is probably a cultural thing. I can’t seem to get enough incense, cedar, and juniper scents but can’t handle most of the strong black peppers or spices. 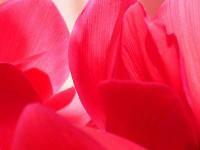 OperaFan: I’m embarrassed to say that there are many types of fragrances that would qualify. The first type that comes to mind, though are fragrances with prominent vanilla bases which render the perfume too sugary-sweet to wear. This extends to a lot of heavy ambery perfumes, which, thanks to a very negative encounter at the opera about 3 years ago due to a lady in my vicinity wearing about half a bottle of some ambery stuff and completely neutering my light and airy iris perfume, makes me wary of all strong amber fragrances. Surprisingly the classic Guerlains don’t seem to be a problem, but that’s just a testament to the masterful blending applied by the perfumers. Victoria: Thank you for your nice words, Bettye! figuier: I’m with you on the AplS. I’ve generally got a high tolerance of cumin etc. but this was beyond awful, laundry detergent crossed with the kind of smells detergent is designed to counteract! Total scrubber…MKK on the other hand seems to me utterly innocuous, just hay and animal warmth. There aren’t that many specific notes I can pinpoint as not-me, but scents with lots of obviously-synthetic/shampoo-ish sillage make me very uncomfortable (e.g. Love Chloe, Clinique Happy, Lancome Miracle, the original Alien, YSL Safari & Manifesto) . I’m also not too good with colognes, unless I’m in a hot and dry climate (i.e. not here in the UK). Erin T: I’m starting to wonder if I’m finally losing the categories of scents that I’m afraid to wear. Leathers, lilies, powdery scents – I wear a few of them all now. I’ve always like animalic notes and even melons and the odd aquatic. But I thought I still couldn’t do really smoky ones: Le Labo Patchouli 24, CB IHP Burning Leaves, SSS Fireside, Vero Onda, etc. They all smell like bratwurst on me. Grilling bratwurst. Victoria: When you smell something constantly, it gets old. Austenfan: I think I dislike too much powder. Teint de Neige ( what a lovely name though!) is the one fragrance that had me almost gag. Another one I had trouble with is Le Dix. I don’t know if the problem was the aldehydes or the powder. Austenfan: Well when you have been dousing yourself in YSL Paris for over a decade, eau de parfum, most of the time, it seemed quite light. I don’t know if it has been reformulated but I find it loud and a tad harsh these days. E. Lime: There is a quality to some perfumes that I classify as “oily” or “fatty” that I have some issues with, as it tends to turn my stomach. I find this quality in many of the Guerlains and in some of SSS and I wonder what it is. I wanted to love Tabac Aurea and SL Bois de Violette, but both of them reacted strangely with my skin, giving it a sharp and unpleasant scent–I think it is the cedar in both of them, however, cedar in other scents if combined with different notes doesn’t seem to be a problem. solanace: I’m so curious about that, V! It might be the ambrette, but I can’t tell for sure ’cause I don’t know the material. When I read that 1932 was somehow related to No 18, I lost all interest. No. 18 is my least favourite sent in the wide world… I just can’t get (or believe) it. Maybe those Place Vandome diamonds are not my thing, after all… And since we are on it, Beige smells very sharp and flat to my nose. It must be me. I can find no white flowers in there, at all! Daisy: I just looked up I’m Rock and guffawed out loud at the screen! The chains! The skull charms! The electric guitars that I think are charms too, but just seem randomly stuck on! Hysterical! Somehow I feel that awful packaging means awful insides, so i never venture into trying perfumes that “look” questionable. Perhaps it has prevented me from trying an amazing fragrance, but i’m sticking to my guns: if the maker had enough taste to formulate/pick a good fragrance, they should have enough taste to pick a good flacon. Andrea: I don’t like to smell anything with cumin, as I live in Texas and it smells like someone who just went out for a (yum!) meal of Mexican food. Love the food, but I don’t want to smell like I have not bathed, and that is how cumin is on me. I was testing some scents that I loved recently when I realized that they do not actually smell “good”. When I first began learning about fragrances, I would have hated these scents! I realized that (as I tend to be a people-pleaser) I would never wear the scents that seem to polarize in public, I might use a sample at home. I like Elie Saab, but when I tried it I smelled heavy indoles. Narcisco for Her, EL Private Collection, the SJP fragrance… All of them seem to have that “diaper” smell somewhere within the other notes. I wish I did not smell it, as I love these otherwise! But learning about indoles has been wonderful, as for years I thought a Private Collection-wearing relative had tummy issues! When I smelled Elie Saab with the same note, I realized my mistake. Andrea: I agree! We are all so different, and even smells we think we don’t like smell fabulous to us when on other people. Part of the fun of this website/blog is hearing other’s opinions! The other part is, of course, the amazing writing and education from you, Susanna and Andrew. annmariec: I’m still reading my way through everyone’s comments but I just want to say I love those parrots! What are they Victoria? That colour is so bright. I adore parrots and we have lots of parrots in our gardens where I live. King parrots are one of my favourites. They are have different colouring and are darker than the parrots in your photo, but the colours are unbelievably vivid. It’s as if they are their own light source. Victoria: When I first saw them in a snow covered park, I thought that I was dreaming. I worked all through the night to finish a major deadline, and then I was so tired that I couldn’t even sleep. I went for a walk and saw green parrots. “I must be hallucinating,” I thought. i think it’s always good to remain hopeful – so why not try new things? even if you don’t love them, you have still experienced them. and life is here for the experiencing. annmariec: I go through phases of trying perfume genres I don’t like, following the principle (which applies to clothes too) that if you only wear what you believe suits you, you are in danger of falling into a rut. I still can’t go near fruity fragrances of the Flowerbomb (and, lately, La Vie est Belle) type, but I have learned how invigorating, satisfying and sensual fruity notes can be (in moderation, especially over a contrasting chypre base). bhama: My challenging perfumes as of now are Bulgari Black and Guerlain Habit Rouge. I cannot get past the rubber note in BB, but I am going to keep on trying as I like the dry down very much. The powdery aspect of Habit Rouge is too cloying (turns my stomach) for me, even though I have no issues with Shalimar!!!!! I don’t find Shalimar EDT that sweet at all!! annmariec: Oh I do hope you can persist with the Black! I don’t ear Black myself (found it a bit meh) but bought some for my teenage son and on him it is glorious. (I have to restrain myself from begging him to wear it more often; how embarrassing that would be for a teenage boy!). bhama: Dear Annmariec- I will try to persist, but the rubber note is tough! You have given me an idea though-My 8 year old is a budding perfumista and he has been playing with my Shalimar and Coromandel. I am going to give him Habit rouge since its the boy version of shalimar! The other day he went to his violin group lessons wafting of ANGEL!!!!!! I caught it in time to clean him of it. Those poor children wouldn’t have seen it coming!! Angel should have its own warning label!! annemariec: Maybe you had better hide the Angel. 🙂 Anyway, sounds like you have already set your son on the right path. Hopefully when he is grown up and gainfully employed he will be giving YOU perfume! Andrea: I have had problems with some sandalwoody components. My nose went crazy and I got this horrible sharp chemical note overruling everything else. It started with Sublime de Patou and Sandalo di Etro from one day to the next. Sandalo I sold off, so I couldn’t tell, but after a hiatus of more than two years Sublime smells ‘normal’ again. What happened? Victoria: I can relate to that too. I love natural sandalwood, but the sandalwood synthetics especially when used on their own (rather than to round out an accord) can be very harsh. The drydown of many classical fragrances was ruined for me when the synthetic sandalwood was substituted for natural. I’m not advocating “all natural all the time,” but in this case, it is the question of balance. Sublime might have been reformulated again. I’ll think ‘lime-lavender?’ next time I smell this component…will find out. On their own I love those notes. Annikky: Many of my potential problem areas are quite common – too sweet vanilla and amber, rough vetiver/patchouly, very strong incense, etc. Non of those have surprised me, but I’ve got one perfume issue I didn’t expect. Austenfan: I don’t know because I have never tried No.22, but aren’t 22 and 5 much heavier on the aldehydes than the other Exclusifs? Lauder’s White Linen uses a hefty dose so you might want to try that one and see whether it boters you in the same way ( if you haven’t already). Victoria: I too agree with Austenfan. No 5 and No 22 are the only two aldehydic florals in Chanel’s collection (basically, a floral structure + a generose dose of aldehydes). None of the other fragrances you mention are. The most aldehydic of them would be Beige, but even there the aldehydes are subtle. Noele: I agree with you about aquatic scents. They’re uninteresting to me. I wonder if I subconsciously associate “aquatic” with a watered down perfume. Sweet perfumes definitely need to be tempered. I like (and even bought) Louve but SLs Rahat Loukoum was cavity inducing for me. The one perfume line that I cannot warm up to is Chanel. Even the Exclusifs. There’s a shrillness to them that I find off-standish and the dry down usually smells cheap on me, like a drugstore deodorant. axum: I find leather challenging in perfume, particularly when it is really raw and starts to remind me of roadkill, or jerky. This is frustrating, as I like the concept of leather in fragrance very much. Happily I can and do wear Bottega Venetta. Jack Sullivan: Oddly enough, while I don’t mind stinky animalic scents I have issues with the much gentler leather and tobacco notes. It really depends on the general balance of the ingredients but in numerous cases these notes leave something bitter on my skin. My major issue is with iris – most fragrances with a prominent iris note feel like being trapped in a damp cave. I discovered this feeling upon testing Iris Silver Mist (my only “no-go” in the SL line so far). Cybele: I cannot deal with the average floral fragrance such as Flora, Valentina, Lola, Romance, Chloe etc. the opening is usually an immediate turnoff for me and I can’t tell them apart at all. Mitzi: Oh me too! I could not for the life of me tell the difference between say Flora and Valentina, or almost any of Marc Jacobs scents, apart from his very first. It’s a first strong hit on your head with a bag full of synthetic strawberries, and I am all knocked out. gentiana: Wow! Interesting topic… The last year and something I was constantly exploring my boundaries regarding fragrances. I have a love/hate relationship with big white florals. Or, properly said… with flowers and florals. I adore the scent of jasmine (each year in may I would actually like to move my home in a jasmine bush). I love lily, lily of the valley, tuberose… etc. The perfumes based on these react on me and give a sharp metallic or urinous smell. And on others give me a nose-wrinkling reaction: they are everything that I am NOT. The strangest experience was, although with Narcotic Venus from Nasomatto: I had a repulsive reaction in the shop, had in mind to scrub it off at the first gas station… I had a journey of about 3 hours to do, and wanted to see what happens. After one hour..a wonderful, hounting smell kept coming out from my coat’s sleeve… I turned back and caught the SA right the minute before closing the shop, shouting not to leave, ’cause I die if I go home without this perfume. Jennifer: I think my issues are mostly around fragrances with iris or violet. I’ve found that iris is just dandy when combined with sweet notes (i.e. Diptyque Volutes), but most of the time it just seems soapy. I’m not a fan of soapy. Dzonkha didn’t work for me at all. All I smelled was soap and vetiver. I didn’t get the incense that others seem to. But because I know that iris can work for me sometimes, I’ve been wanting to try other iris-centric fragrances and see if I find anything that works for me. Violet can be a tough one because I think my skin pushes violet notes a bit. But I’ve tried a couple of things that had an unobtrusive violet note that didn’t overpower on my skin, so I’m thinking that’s an avenue to explore as well.